Great day for pulling sweet clover! This is undoubtedly sweet clover season, and we are occupied, both at Pleasant Valley Conservancy and Black Earth Rettenmund Prairie, with controlling it. The problem is worse at Rettenmund, and some of our personnel are spending quite a bit of time on it. Today, I got into the act. What a day for pulling sweet clover! After three days of heavy rain, the ground was loose, making pulling easy. Also, the weather was fantastic, cool, breezy, with scattered clouds and low humidity. At Rettenmund Prairie, sweet clover is present in large patches scattered here and there across the North Unit. The photo here shows a typical "wall of sweet clover". Not a pleasant sight to contemplate. I am using three methods on a patch such as this. The smaller plants, either flowering or not, are pulled with one hand, grabbing the stem very close to the soil surface. Care is taken that the whole root is removed. The larger plants, with one or two major stems, are pulled with two hands, using a Parsnip Predator shovel to loosen the roots. The large, multi-stem plants, which are really hard to pull, even with a shovel, are being sprayed (basal bark) with Garlon 4 in oil. I simply pull the plant back to uncover the base, and give each stem a brief spritz. I carry the herbicide in a belt bag. This procedure works well, and damage to adjacent "good" plants does not occur. Sprayed plants show visible damage in about three days. The importance of getting the whole roots must be emphasized. Sweet clover forms a very long tap root (see photo), and if the stem is broken or cut above the soil surface, dormant buds in the root collar start to grow and form a new plant, which generally goes on to flower. Such plants generally make seeds, thus contributing to the seed bank and delaying for years the eradication process. I need to emphasize how quickly sweet clover takes over a natural area. The patch I eradicated is a very high quality prairie remnant that a few weeks ago was full of great plants. The sweet clover plants have been flourishing in the rainy weather we have been having, and were quickly able to produce that "wall of sweet clover" shown above. What happened to all the good plants that had been there? They are still there, but had been doomed if the sweet clover was not removed. As I pulled the sweet clover, I made a list of prairie plants that were underneath. Without even trying, I listed 27 species that were being suppressed (see the list below). Now they are back in the open and able to continue to grow, flower, and set seed. Obviously, getting rid of sweet clover makes a lot of sense. The 5 acre East Basin was planted last November by a group of volunteers. As expected, this year it is mostly weeds, which Kathie has mowed over the past week. While mowing, she was pleased to see lots of new seedlings from last fall's planting. The species she saw are listed below. There are undoubtedly lots of other species, but some are nondescript as seedlings. Also, most grasses (except the listed June grass) are fairly hard to identify when they are just starting. Maybe in a month we'll have a longer list. Ann Thering has been photographing butterflies at Pleasant Valley Conservancy for several years, and kindly provides notes on what she sees. The table below shows the data from mid June 2010. Here is what she said in her email: "Numbers are down a bit from last year (the general trend this year is for higher numbers) but diversity is still good. The purple milkweed is spectacular. And your large common milkweed clones are awesome. The butterflies go nuts over this. The Delaware Skipper, while not listed as threatened or anything, is always a nice find. You never see many in one spot." Ann will be giving a course in August at Olbrich Garden on buttefly gardening. 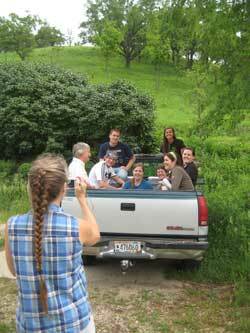 See the details in the Empire-Sauk Chapter (Prairie Enthusiasts) web site. The East Basin is our last large area under restoration. It is a 5 acre basin with fairly steep topography (and unusual geology and soil structure) that is on the east boundary of the Conservancy. Last November a nice group of volunteers planted this area to dry mesic and wet mesic prairie. Like all new prairie plantings, success is greater if the site is mowed (at least twice) the first year. Mowing is now in progress. The East Basin isn't your normal flat ag field which can be easily mowed. It has impressive vertical elevation changes, and also has quite a few stumps remaining from the major tree removal work that was done 2-3 years ago. Although the contractor was very careful to cut the stumps low to the ground, it is still necessary to keep a sharp lookout for impediments to the mower. Kathie is doing all of the mowing, using our small Kubota tractor and a Land Pride brush mower operated from the power take-off and three-point hitch. We hadn't used the Land Pride for almost 5 years, so we had it thoroughly serviced first. So far, it has been working like a charm. 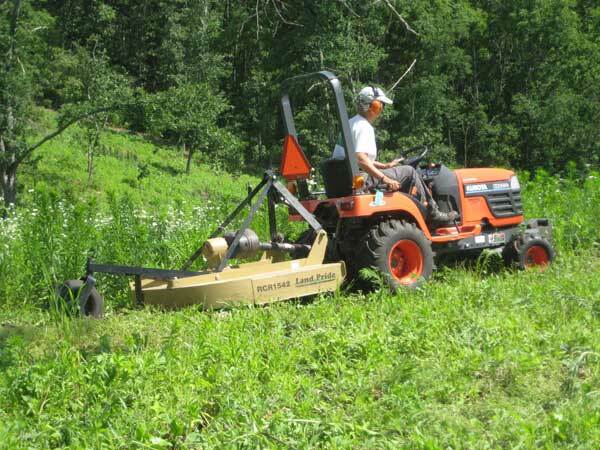 The vegetation being cut is primarily annuals, and the main purpose of mowing is to keep them from setting seed. Also, mowing opens up the soil so that the prairie plants can get better light. The Land Pride is adjusted to mow at a height of 8 inches so that the tiny prairie plants are mostly not mowed. Before starting to mow, Kathie walked the site and put flags in areas where stumps or rocks might cause problems. Also, there were some areas with "good" plants, especially shooting star, that we did not want to mow, so she flagged them. Mowing in hill country is always a challenge, since roll-over of the tractor is always a possibility. (A summer doesn't go by in this area without a report of at least one farmer death from tractor roll-over.) 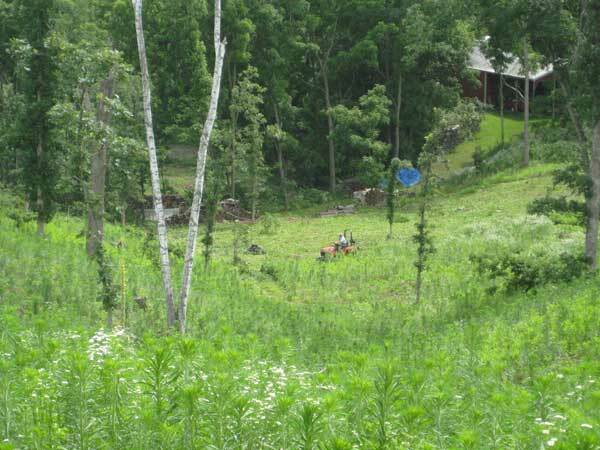 The steeper areas have to be mowed up and down instead of sideways, which takes a lot more time. The Kubota has a substantial roll bar, and Kathie always wears a seat belt. Kathie mows very conservatively, and is doing a great job. So far, she has put 8 hours into this project, and is about half done. If the weather cooperates, she should be done before the end of this week. While mowing, Kathie has also been making notes on what prairie plants are visible. These are mostly small seedlings, although a few plants such as lupine are fairly large. So far she has seen about 8 species. Purple milkweed (Asclepias purpurascens), a State Endangered Species, is at peak flowering right now. This plant, a characteristic savanna indicator species, first appeared spontaneously at Pleasant Valley Conservancy after we did some initial clearing followed by a prescribed burn in a white oak savanna. 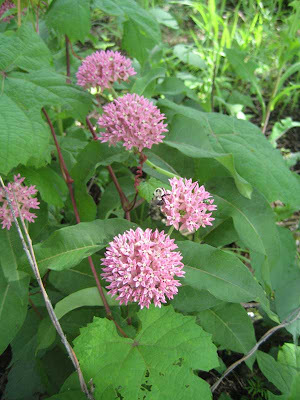 As we continued to restore more savanna areas, more purple milkweeds cropped up. Once pod formation occurred, we collected seeds and raised plants for transplanting. We have also thrown out seed in likely areas. We now have over 40 sites where this species is growing, some native and some from transplants. How can we tell a spontaneous plant from one arising from seeds we threw out? The two new stands this year both are right next to trails, in places we never would have thrown seed. Apparently, seed continues to get around on its own. This is a perfect time to find new flowering areas, because they stand out so well, even when growing among other savanna forbs. I always do my surveys for new populations in the middle of June, which is peak flowering time for purple milkweeds. I published a paper last year in Ecological Restoration on ecology and conservation of purple milkweeds, which describes "tricks" we have developed for raising plants and getting them to grow in the field. You can find a PDF of this paper on the Pleasant Valley Conservancy web site. If you type "purple milkweed" in the Search box for the PVC site, this PDF should come up at the top of the list. By now our annual mid-June hike at Black Earth Rettenmund Prairie (State Natural Area) has become a tradition. Last night we had eight repeaters among the 22 (or so) people on the trip. The wood lilies, of course, were the main attraction, although this year they were about a week ahead of schedule (that very warm April), so we missed the peak. There were still plenty left, as well as such other rarities as Zigadenus elegans and Pediomelum esculentum. Also, coming along and soon to be in flower were compass plant, butterfly milkweed, lead plant, Coreopsis, rattlesnake master, and prairie cinquefoil. Mid-summer will be here before we know it! Also coming along is sweet clover, one of the long-term menaces at Rettenmund. If you have been following my posts for the past two years, you have seen the progress we have made eradicating sumac using 20% Garlon 4 in oil as a basal bark treatment. Each sumac stem is pulled back to expose the base and a single spritz of herbicide (from a spray bottle) is applied at the bottom. This technique really confines the herbicide to a narrow zone around the stem, thus eliminating any problem with peripheral damage to "good" plants. With small patches or isolated plants (that would in a few years become large clones), complete eradication usually occurs with a single treatment. On Saturday June 5 we used this technique at a Prairie Enthusiasts work party at Black Earth Rettenmund Prairie. The north unit, which had not been burned, had lots of medium sized sumac plants, scattered in small patches or as single plants. The photos here were taken today (8 days later) and show the results. The herbicide causes the leaves to wilt within a few days, and after a week they have turned red. Within two weeks the leaves are black and then fall off. 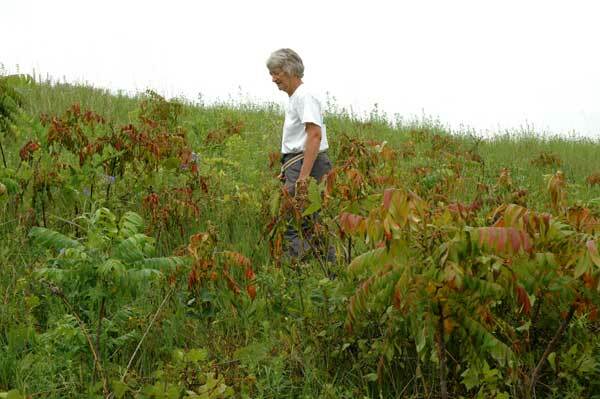 Because sumac is clonal, with an extensive underground network, it is necessary to treat every stem. With large clones, complete eradication may require a second treatment due to the root suckers that arise from still-living rhizomes. However, my follow-up studies with relatively small clones, or single plants that are well separated, showed that a single herbicide treatment is enough to eradicate. If there is nothing much "good" in an area, then a backpack sprayer is quicker than a spray bottle, but I don't advise that in high-quality sites, as control of the herbicide is less certain. Because the herbicide is confined only to a narrow band at the base of each stem, no peripheral damage occurs. At Black Earth Rettenmund, compass plant and lead plant were very near to treated plants and were not affected (the photo to the left shows lead plant and a dead sumac side-by-side). 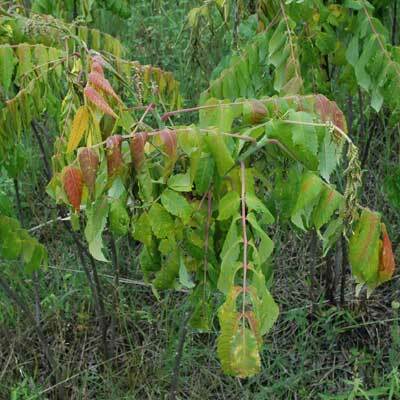 The key to sumac control is to catch the clones when they are still small, and be sure to treat every living stem. Those stems missed in the initial treatment will be easy to find, as they will still be green while the treated plants are red and dead! Tuesday it rained all day; perfect weather for pulling sweet clover! Most of our sweet clover is white, but for some reason, at the east end of the south-facing ridge there is substantial amounts of yellow. Not surprising, the Valley Prairie, which is down hill, also has yellow instead of white. This early in the season, any flowering plants pulled can be left on the ground, since they will not go on to make seed. Later on, when the flowers are starting to make seed, we bag the plants and take them off the site, since some may go on to produce viable seed. Because it is a biennial, sweet clover may be worse one year than the next, although after a while this phasing becomes less pronounced. 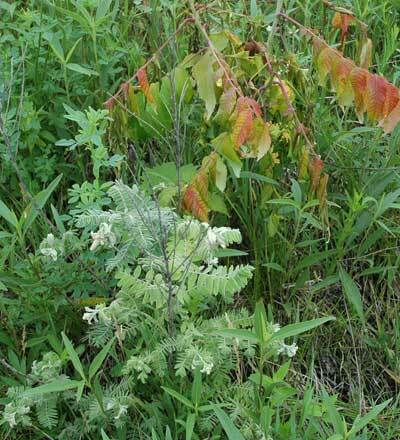 Newly burned areas often show a large flush of first-year plants the year of the burn. Left alone, these plants will all go on and flower the next year and set seed. 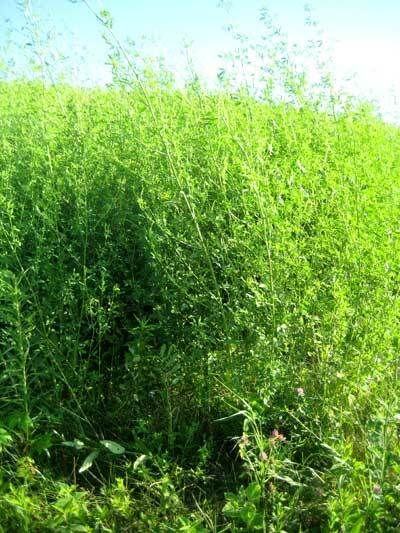 Patches of sweet clover too large to pull can be mowed, but the timing is tricky. If you mow too early, they will resprout and go on to flower, If you mow too late, seed formation may have already started, in which case you have to remove the plants from the site, a large chore in itself. One sweet clover phenomenon we discovered at Black Earth Rettenmund Prairie is a new flush of growth in the early fall. These fall plants are very short, but still have flowers. Because they are short, they may be missed among the generally tall prairie plants. We discovered this fall-growth phenomenon when collecting seeds, and found ourselves wasting a lot of seed collecting time pulling these little, but flowering, plants. I don't know how long it takes to eradicate sweet clover from a site. We have been pulling it at Pleasant Valley Conservancy for over 10 years and haven't eliminated it yet. Many prairies are plagued with sweet clover, either yellow (Melilotus officinalis) or white (M. albus). Because of its long-lived endurance in the seed bank, you don't eradicate sweet clover very easily. We will be spending a lot of time from now until late July on this pesky plant. Yesterday, we had a volunteer group at Black Earth Rettenmund Prairie and spent about half the time hand pulling M. albus, the species present there. Fortunately, the recent rains made it relatively "pullable", so we did not need to dig it with our Parsnip Predators. This week we'll also be starting sweet clover work at Pleasant Valley Conservancy, where we have both species. M. officinalis is flowering now, making it easy to spot, and especially important to get. Later we will have to deal with M. albus, which is more common there. The key to sweet clover control is to keep the plants from setting seed. Since they are biennial, once they flower they die. Now, in the early stages of development, it is not necessary to bag and remove the plants. Later, when they have already started to make seeds, it is necessary to take them off the site. How long will sweet clover seeds persist in the soil? The gossip says 30 years, but I doubt whether there is much data to support this number. We behave as if the seed bank will be around forever, and assume that every summer starting now pulling sweet clover will be a main chore. Sweet clover was introduced in Wisconsin as a pasture crop in the 19th century, so even if it isn't planted much any more, it has a long history here. The seed coat of sweet clover is very hard, making it possible to remain dormant for many years. Burning will scarify the seeds and stimulate germination (the late Virginia Kline of the UW-Madison did some pioneering research on the role of fire in sweet clover development). I have seen large flushes of first-year sweet clover plants in areas burned for the first time. Sometimes removal of the second-year plants (the first-year plants are almost impossible to pull) will almost eradicate such flushes, but there will undoubtedly be seeds that were not scarified and will germinate another year. Long-term persistence is essential. In the last couple of days we have had visitors here for short tours of Black Earth Rettenmund Prairie and Pleasant Valley Conservancy. These two State Natural Areas could not be different in character, but they are both very interesting. 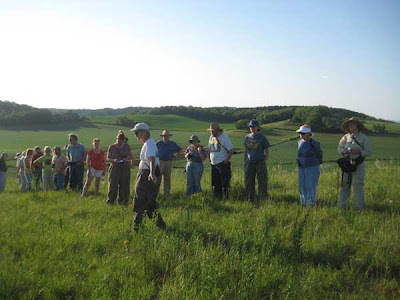 Black Earth Rettenmund is a tiny but very high quality prairie remnant (I think it is one of the best in southern Wisconsin) that has had a venerable history. Pleasant Valley Conservancy, is a fairly large but newly restored site, with a focus on oak savannas. One of our visitors was a small mammals researcher from UW-Stevens Point who will be using these two sites as part of a larger study in southern Wisconsin. We are delighted to be able to see such research under way, and are eager to see the results. The second visit was by a group of environmental studies students from UW-Oshkosh, under the tutelage of Shannon Davis-Foust. Because their time was short, we trucked them to the top of the ridge and let them walk down through the south-facing slope. The conditions could not have been better. The wood lilies are starting to bloom at Black Earth Rettenmund, and we also saw quite a substantial number of prairie turnip (Pediomelum esculentum, a Special Concern species). The savanna understory at Pleasant Valley Conservancy is also lush right now, and lots of early summer species are in flower bud and should be showing in the next several weeks. It is impressive how quickly everything has grown as a result of the good rains and warm temperatures.